I had my chuckle, then I started thinking about it. I posted a link to Stone’s prank post on the Beancurdturtle Brewing LLC Facebook page with the comment “I could do this for real, and make it good. No fooling!”. Someone commented “Do it. I dare you.” I opened my big mouth, got called out, and there you go. Most everything I brew now is a pilot for a collaboration brew or gypsy brew, or to further develop a targeted beer. I rarely brew just for fun. This offers me the opportunity to brew for fun, and for an object lesson in using vegetable adjuncts. Evidence of a test asparagus and hop tea. The target for No Foolin’ was a clean ale base, restrained (East Coast) neutral bittering hop profile, enough asparagus to contribute some grassy/herbal/dank characters, and late and dry hopping to compliment the asparagus presence and not overwhelm it. I started with my taproom tested recipe for a Double White IPA base, plus a changeup of the hops and a couple other tweaks. 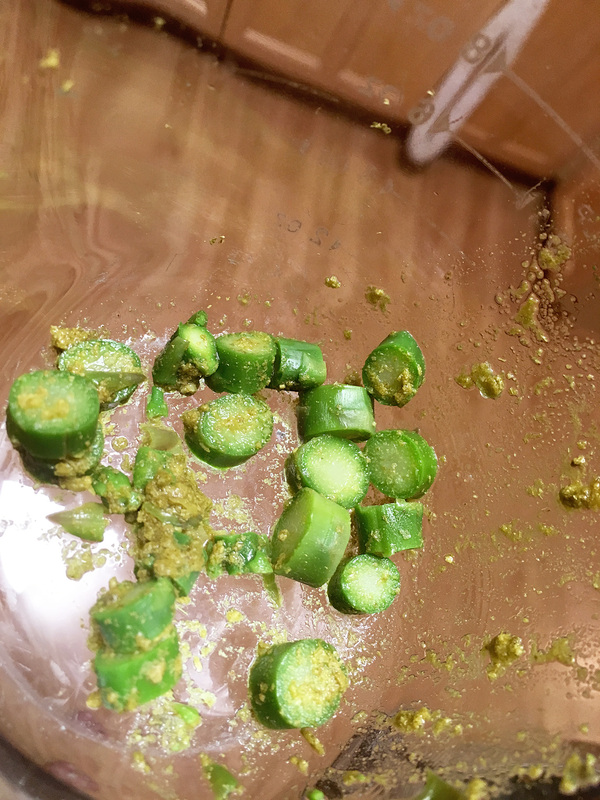 I made a tea with asparagus and the hops to provide a checkpoint, and the components seemed to work together. The brewday went well with no surprises and I hit all the expected targets for extraction. Fermentation schedule progressed as expected, utilizing a diacetyl reduction cycle for a clean base beer, and attenuation was a little higher than expected. 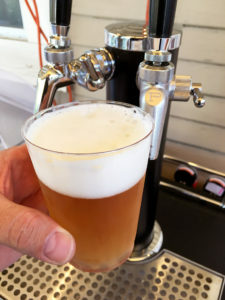 I kegged and carbonated the beer – a taste at this point showed good promise. Nice pour of No Foolin’ – Asparagus IPA. A week after packaging and the first pour is exactly what I targeted. Crisp and clean White IPA base. Late hops presenting fresh citrusy/dank characters, though not burying the asparagus. The asparagus is present in aroma and flavor/finish, though not overwhelming the beer. I’m very pleased with the beer and find it very enjoyable. Other tasters think it’s great. Even tasters that don’t like asparagus have claimed to enjoy the beer very much. 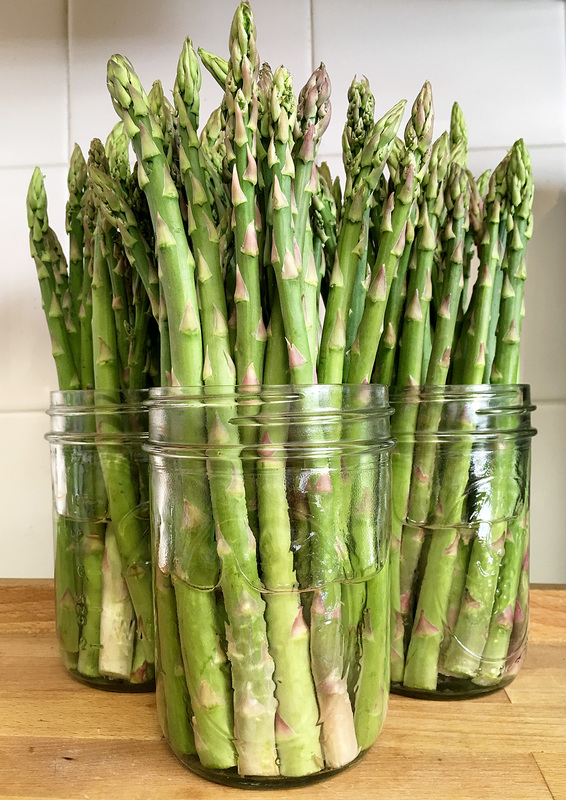 So what started as a April Fools prank, progressed to a boast, answered with a challenge, results in a very cool Asparagus IPA. No Foolin’.